Modern homelessness, as we know it today, began in the 1970’s. During the Reagan Administration, affordable housing dollars were cut but almost 75%, leading directly to poor working families experiencing homelessness at alarming rates. Folks began to organize in the 1980’s, this was when our organization was formed. At the same time, a group called the National Union of the Homeless (NUH) developed out of the first resident-run shelter in Philadelphia. “In the late 1970s and early 1980s the United States economy underwent a series of changes that led to a sharp rise in homelessness. Homelessness was no longer characterized by down and out individuals living on skid rows. For the first time in US history, families were increasingly becoming homeless, and the shelter system was created to house them. 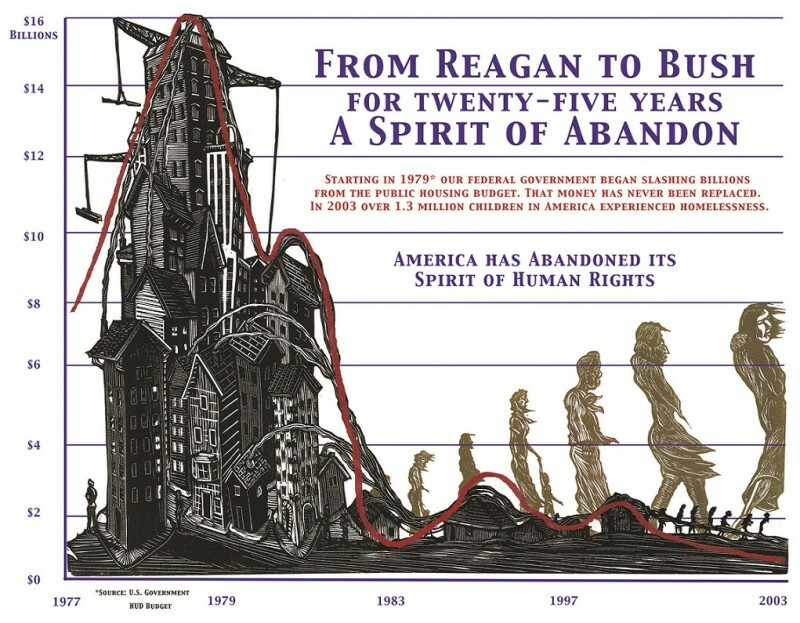 Out of this common experience of dislocation and dispossession grew a national organization of homeless people that mobilized thousands throughout the US in the 1980s and 1990s. At its height, the National Union of the Homeless (NUH) had over 20 local chapters and 15,000 members in cities across the US. The NUH was active between 1985 and 1993. During this time, NUH mounted several campaigns, first aimed at overcoming stereotypes of who was homeless, then later focused on appropriating housing for its members. Their actions used slogans like “Homes and Jobs: Not Death in the Streets” and “Homeless Not Helpless.” They mounted civil disobedience like the Tompkins Square Tent City (detailed in Tent City Blues, an article in the Sept-Oct 1990 issue of Mother Jones), a national series of housing takeovers (watch in the documentary, The Takeover, from 1990), and the Union organized and participated in the Housing Now March along with the National Coalition for the Homeless and several others. We encourage anyone reading this to learn more about where our collective work has come from by checking out the above links, and also visiting the Homeless Union History Project and the National Union of the Homeless Wikipideia page. We are calling on you and those in your community to take action to demand action to fix the affordable housing crisis, address racial inequality in our cities, and end the criminalization of poverty. On Saturday, April 1, 2017 we will hold a rally and overnight vigil on the National Mall, and at city and state legislative buildings across the country. Bring tents, bring signs, bring your friends and families and stand up for our collective need for safe, decent and affordable housing. Preserve funding and create further local, state and national Housing Trust Funds that fund housing solely for extremely low to moderate income households. Stop ordinances, policies and practices that criminalize and harrass people who are unhoused, promote racial discrimination, and prevent equal treatment of immigrants and those who identify as LGBTQ, especially in access to housing, employment and healthcare. Ensure that safety net programs like food assistance and emergency housing are available to all of those who experience the loss of stable housing. By standing together we can make the changes necessary to end homelessness in America! To each person, the word “home” carries a different meaning. For some, it is simply a roof over one’s head. To others however, the word “home” carries greater significance: it implies a certain sense of comfort provided not only by the protection of having a physical shelter, but also by the support given by a person’s family or loved ones. Thus, having a “home” can also mean having a community to rely upon. This is exactly what the word “home” meant to the residents of Camp Take Notice (CTN) in Ann Arbor, Michigan. The camp was a grassroots tent community of homeless people who worked to create a safe and sober atmosphere in which they could receive food and shelter. CTN partnered with Michigan Itinerant Shelter System-Interdependent Out of Necessity, an organization that facilitates tent communities for the homeless, to create the camp. Unfortunately, the Michigan Department of Transportation ordered the eviction of the camp, stating the residents of CTN were trespassing. Homeless persons were forced to move out of the area on June 22nd, 2012 and abandon the community they called home. An eight-foot wall is now being built around the area in order to prevent the establishment of any other encampments. Of the 68 camp residents, only 33 qualified to receive one-year housing subsidies; the others were left to fend for themselves. In a situation like this, real sustainable solutions for every resident need to be provided. Unfortunately, this rarely occurs when dealing with criminalization of the homeless. Many simply believe that by implementing camping bans and similar laws, the homelessness issue will disappear. Yet, without sustainable solutions attacking the root of the problem, the homelessness issue will still remain widespread. Senator Warren sought another property that could serve as a new location for the camp but was regrettably unsuccessful in her attempts due to MDOT’s unwillingness to delay the eviction. Consequently, there was insufficient time to find another location. Despite these setbacks, she remains committed to the issue by continuing to look for long-term solutions to the homelessness issue. While Senator Warren’s work is inspiring, too few public officials champion the issue of homelessness. In fact, many support criminalization efforts that negatively target the homeless in an attempt to “deal with the homeless problem.” Everyone deserves to have a place they can call home. Creating barriers to housing not only violates basic human rights, but it also counters the better interests of our society. It is thus imperative that more actions be taken to prevent such criminalization laws from being put into place.